Home » News » Forklift Industry News » Stars come out as Toyota celebrates 25 years of lift truck manufacturing in the U.S.
Stars come out as Toyota celebrates 25 years of lift truck manufacturing in the U.S.
Indiana governor, Toyota top brass recognize company's economic contribution as it continues to expand facilities, product line, and employee base. 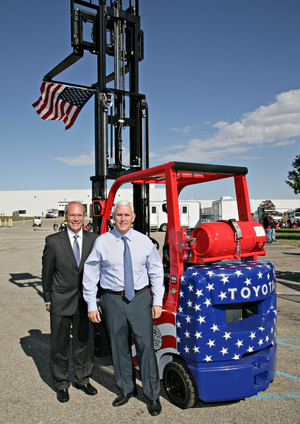 Toyota Material Handling North America President and CEO Brett Wood (left) and Indiana Governor Mike Pence with a specially painted forklift commemorating Toyota's 25th year manufacturing lift trucks in the United States. October 15 was an unusual day in Columbus, Ind., a small city that's best known for its modern architecture and displays of public art. For one thing, Indiana's governor, Mike Pence, and a host of Japanese dignitaries (including one of the cofounders of the Lexus line of autos) were in town. For another, the factory where Toyota Industrial Equipment Manufacturing Inc. (TIEM) builds Toyota-brand forklifts, completely shut down that afternoon, and 1,500-plus employees were outside on the lawn or seated under a circus-sized tent. The occasion was the commemoration of the manufacturing plant's 25 years of operations in the United States. The event also highlighted TIEM's $16 million-dollar expansion and building renovation—the 14th expansion since the plant opened in 1990. The 50,600-square-foot addition will increase the facility to 1.1 million square feet of manufacturing and support space, including room for new manufacturing technology and product development. The expansion includes a two-story office building, a new cafeteria, a new storm shelter and locker room, and additional space for Toyota's on-site medical center for associates and their families. The new building will also serve as headquarters for Toyota Material Handling North America (TMHNA), the North American division of Toyota Material Handling Group, which relocated from California last year. Following presentations by current and former Toyota executives and local political figures—including a rousing speech by Pence about U.S. manufacturing and job creation—TMHNA President and CEO Brett Wood, a former high school and college soccer star who remains active in local youth and adult soccer programs, announced that TIEM would sponsor a new indoor soccer facility in partnership with the Columbus Express Soccer Club. Company associates were treated to a pig roast and a live performance by a local country-western band, and also received commemorative jackets, t-shirts, and soccer balls. The plant expansion comes none too soon. Sales continue to grow, and TIEM earlier this year presented the 500,000th lift truck built at the Columbus plant to WestRock, a Norcross, Ga.-based concern that is the product of a recent merger of RockTenn and Mead Westvaco Corp. TIEM also has launched eight products in the past two years, including three—a new reach truck, an 80-volt electric truck, and a high-capacity IC forklift—last month alone.